To get started with ZynBit for Outlook, open the URL app.zynbit.com and select the green Create Account button at the bottom of the screen. You will be asked to sign into Salesforce with your normal Salesforce credentials. A configuration screen will then appear to let you complete account details. When the required items have been completed, click the green Next button at the top. A screen will display, allowing you to connect your mailbox to test and use the ZynSync product. If you are only interested in the sidebar or your company has only purchased a Starter subscription, then you can skip this step using the green SKIP button at the top right side of the screen. If your subscription is Pro or above, you will usually want to complete these steps now, although configuration can be completed at any time in the future as well. Pressing the button for Google, Office 365 or Exchange will allow you to connect a mailbox of this type for the sync program by displaying that login screen. Pressing the Windows button will move you to the next step. 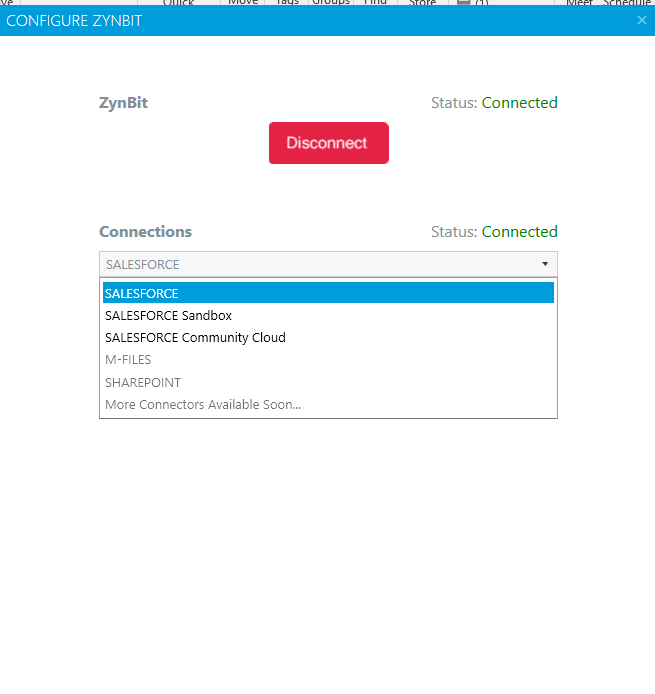 You will then be prompted to connect to Salesforce, which will allow you to log in and verify your intent to allow ZynBit to do work on your behalf. This completes the profile setup, and you can then select the software you need to download. Most individual or small company users will want the OWA plugin for the web Outlook email, or the Desktop Plugin for desktop Outlook. The Windows button at the bottom provides the link for the MSI file. For Outlook Desktop, once the email client is selected, the download will start. When you install the software, select the option “Just me” on the lower left part of the second screen. Activating your account will open a configuration screen that will allow you to enter credentials for ZynBit and Salesforce. These credentials, together with your Outlook credentials will allow you to quickly and easily transfer email information into Salesforce. Restart Outlook to see the ZynBit plugin in the dark blue Commands ribbon of Outlook. 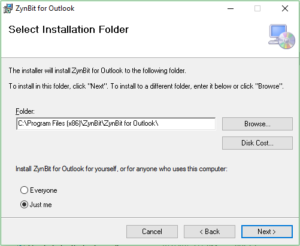 When you open Outlook, you will be prompted to connect ZynBit. Click Sign In With Salesforce. To change the account connections click the Configure button beside the Zynbit icon. Check the Disconnect button below the Connections line. You can choose Salesforce Sandbox or Community Cloud environments here and enter the correct credentials. Later, you can disconnect from the Sandbox and reconnect to production.